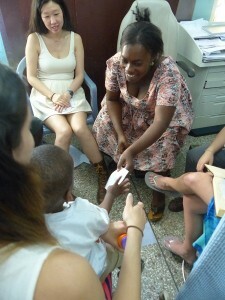 Today, on African Union Day, we began our week at Korle Bu Teaching Hospital. Every Friday for approximately 6 years so far, Albert Osei Bagyina, the one and only speech therapist in Kumasi, travels on an overnight bus to get to Accra to conduct evaluations and follow-up visits with clients who come to Korle Bu. Albert makes the 6-hour trip back to Kumasi when his day is finished. This week, however, Albert joined us the whole time. It was great to continue collaborating with him.Today at the hospital, we saw a variety of different clients regarding speech, language, and hearing. We also saw one client for voice; he was a 9-year-old boy who had bilateral vocal fold nodules removed two weeks prior. His mother expressed concerns that he doesn’t drink enough water and sometimes screams and shouts when playing with his friends. Our group thought it would be appropriate to create a social story. A social story is a way to describe a situation, change a behavior and positively promote communication. Together, we created a social story which describes what happens when he screams and shouts too much (his throat hurts, gets hoarse, and thus, his friends can’t hear him). Since his passion is drawing, he was the illustrator of his own social story. We wrote the content of each page with him to ensure it contained necessary elements and language. Then we asked him to read each page and draw a picture that he thought showed what that page was about. It was great that he played an integral role when creating his social story. Hopefully, this will motivate him to read it everyday, and practice good vocal health. Today was a day for social stories because there was another client we wrote one for. This one was to address the child’s behavior of pushing other children when he is in groups. With the child’s mother, we wrote a social story to help her son stop pushing other children (because they get hurt, their moms and dads get upset, no one wants to play with him or talk to him) and to instead work on gently tapping his friends to get their attention and gesturing more when he wants to communicate something. We are hopeful that the social story will help the child, his family, friends and school community.At the end of the busy day, we left excited for more experiences tomorrow and to learn more about Ghana and its culture in celebration of African Union Day.